Real beds are constructed from a selected range of high quality and time-tested products, with a preference for local and natural components. 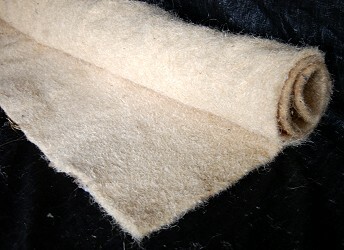 Some vital components, such as the needled wool felt and needled hemp pads, are in strictly limited supply, and the 350 gm. lapper wool is made exclusively for real beds by South Australia's premier wool procesor. Most components are sourced either on the roll or by the bolt, enabling each pad or panel to be hand cut to size, and ensuring the innerspring unit is always generously encased by the upholstery fillings. 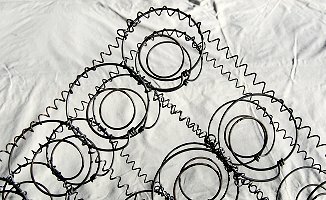 A standard double spring unit is comprised of 312 coils (312 type) of 13 gauge-2.34mm sprung steel with an 8 gauge- 4mm edge support frame. It is the dominant and most durable mattress spring design. The real mattress cot innerspring unit is manufactured without the common rigid steel edge frame that significantly provides rigidity to a innerspring unit. In the case of a cot mattress, this firmness is excessive for the light-weight of an infant, and the real cot spring is edged by a helical coil wire. 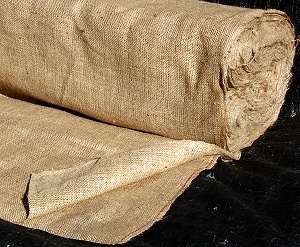 Woven from natural jute, hessian is used universally as the initial foundation layer in all quality uphostery. A heavy weight webbing, woven from natural jute, hessian is used universally as the initial foundation layer in all quality uphostery. All read beds innerspring units are fully boxed with 18oz. jute hessian and the edge frame bound with jute webbing. 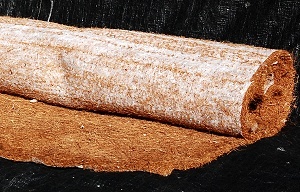 Coconut coir is a natural fibre harvested from the husk of the coconut. A heavy duty fibre pad with minimal moisture retention and maximum ventilation, it is renewable, recyclable and biodegradable. The superior foundation pad, it was manufactured for decades by Fibertex P/L and Albion-Riley of Alexandria, but is no longer available. It is now only occasionally available from recycled items. Hemp is a natural fibre grown in Australia. 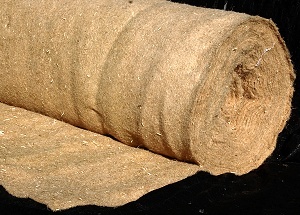 A medium coarse fibre pad, it is renewable, recyclable, biodegradable, and with low moisture retention and excellent ventilation. Grown in Australia and processed exclusively for real beds by Fibretex P/L, now in limited stock only. The needled wool felt pad is an optimal mattress component, hard wearing and providing excellent ventilation. Renewable, recyclable and biodegradable; it is unsurpassed when used as either a foundation and/or a support pad. 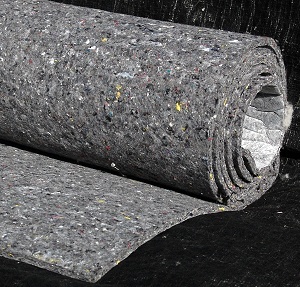 The cotton feft pad recycles long staple length cotton offcuts from the fashion industry into a needled foundation insulation pad that is hard wearing and provides excellent ventilation. Latex is extracted from the rubber tree in liquid form and provides superior resilience and support as well as being a renewable resource. It is non-allergenic, mould free, dust free and resists moisture build up due to the open-cell ventilation properties. 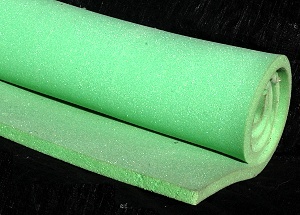 Polyurethane foam is manufactured in Australia from petroleum by-products. Foam use is kept to a minimum in real beds and is always internally sandwiched between layers of natural fibre. While available in eight different densities, only a high resilience grade foam is used in real mattress and bases. This bonded foam is used as the backing for realbeds borders. The superior mattress filling, this 350 gm. 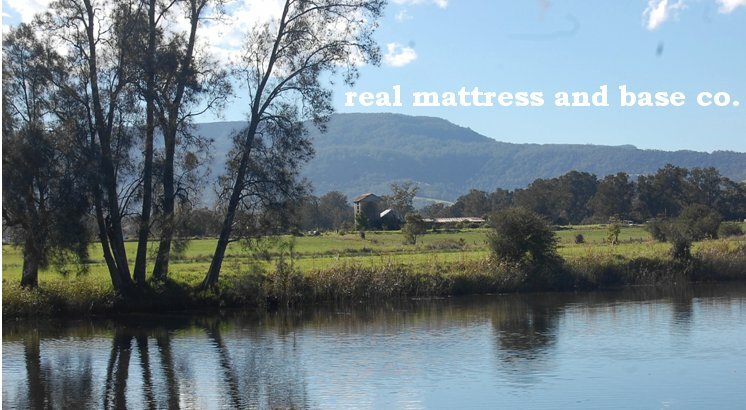 pure wool pad is made exclusively for real beds by South Australia's premier wool processor. A natural spring, wool combines high compression resilience with exceptional moisture absorption properties, and as a natural insulator it maintains a constant temperature. It is also flame resistant, recyclable, biodegradable and a renewable source. In all seasons, wool is remarkably comfortable. During winter it provides warmth, without a tendency to overheat, while in summer wool's moisture absorbency assists to maintain a comfortable temperature. When used in multiple layers, it is necessary that the mattress is hand tufted to ensure long-term stability. A layer of laper wool is always the prime sleeping surface of all real mattresses, directly underneath the cover. 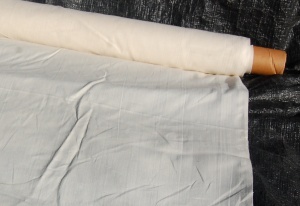 This imported cotton-polyester damask is hard wearing, with excellent ventilation, and a non-slip texture. 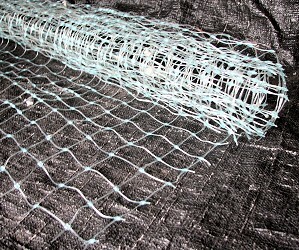 Its loose weave construction is essential for the extensive hand needle-work required by the black label real mattress.. This classic heavy-weight herringbone twill fabric is 100% cotton. The colour is that of natural cotton - unbleached and un-dyed. 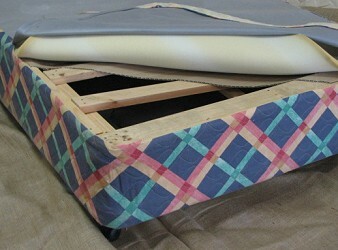 Like all real beds fabrics, it is hard wearing, has excellent ventilation, and a non-slip texture. Cotton is a natural, recyclable and biodegradable. Like all real beds fabris, it is hard wearing, has excellent ventilation, and a non-slip texture. Cotton is a natural, recyclable and biodegradeable. Suitable fabrics should be, ideally, around 290 grams per metre. 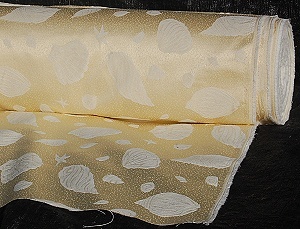 A general purpose cotton fabric, it is mostly used by real beads as the safety-stitched hem on all cut edges, as a backing on upholstered bases, and a for corner inserts. 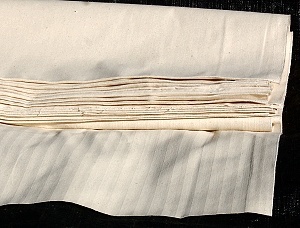 The covers are sewn with Australian manufactured cotton binding tapes and threads. All cut edges are over-locked and safety-stitched with spun polyester. 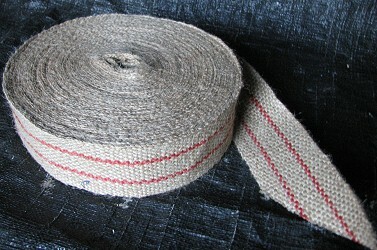 Ruby Italian Jute Spring Twine is used for all internal construction and hand tufting. Tufts are either woolen felt, supplied by Felt Distribution Australia, or leather, supplied by Birdsall Bros, of both of Botany, NSW. The leather and felt tufts are press-cut by Birdsall Bros. The fabric covered upholstery buttons are supplied by All Buttons Great and Small, King Street, Newtown. The exclusive designed real beds base is full innerspring unit boxed a plantation pine frame with timber side-panels, assembled by professional furniture frame manufacturers, Sydney. Hooded twin-wheel castor with oversized steel washer. Each castor load-rated at 50 kilo. Single beds are fitted with six castors, double and larger have nine. For much more further associated information, see Construction. This design appeared in the late 1960s, was not popular and, due to the light-weight gauge wire, is subject to subject to wire fatigue. A straight barrel spring, classically individually encased in a calico pocket and then hand stitched or ring-clipped at the four compass points of the spring-top, and, similarly, four on the bottom. Usually finished with a ring-clipped edge frame at the top and bottom, a sturdier design adds a third frame, ring-clipped at the mid-way point. Currently, of the available modern versions of pocket spring units produced by machine, none have yet been deemed suitable for inclusion as a real bed component. The flex-a-lator is a grid of light-weight wire laid across the top of an innerspring unit to prevent low-density upholstery layers, such as foam, from settling into the spring cones. 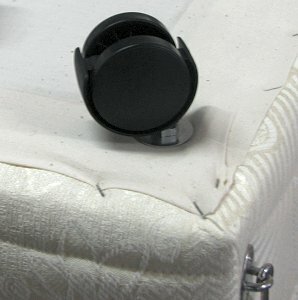 An unnecessary component in real mattresses, the wire is merely an impediment when hand tufting. In the 1990s, the wire was replaced with a plastic grid flex-a-lator. A very heavy-duty coarse natural fibre, sisal has minimum moisture retention and very good ventilation. The imported raw fibre was fully processed in Australia and although renewable, recyclable and biodegradable., it was chemically treated for quarantine requirements. This heavy-weight foundation pad was imported and processed by Fibertex P/L, Alexandria, for a major mattress manufacturer, and but is no longer available. 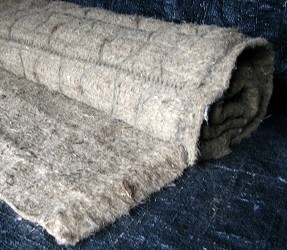 A medium weight pad in jute, a natural fibre with low moisture retention and good ventilation. 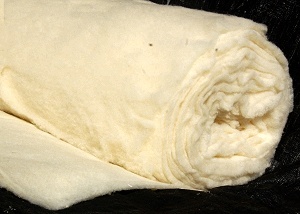 A medium weight pad in cotton. This example is a high quality European pad, and not locally available. 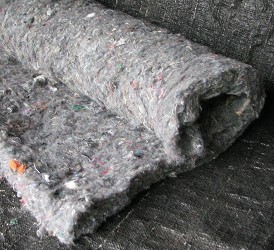 Flock is recycled fabric off-cuts, largely from the fashion industry, that have been shredded, teased, and blended. It is mostly cotton, but, depending on seasonal fluctuations, can include a mixture of fibres. 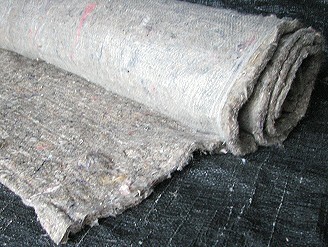 As a result of the blending of range of The mixture of dyed trreads, the end product is mostly grey. Previously used in fabric, these fibres are long staple length and is a superior component to cotton linters, see below. Used only occasionally in real mattresses or bases, as required. 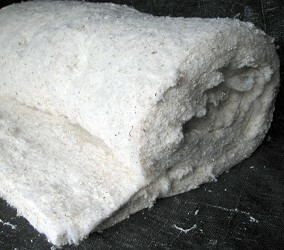 Cotton linters (or lintas) are short staple length cotton fibres, unsuitable for the production of thread, mostly used in Australia in the production of paper. Commonly said to be used in futon mattresses, producersoften add a portion of polyester fibre to counter this cotton's very low resiliance. 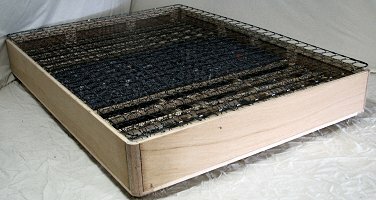 Cotton linters are used only rarely, and only as required, in real mattresses, such as commissioned fully hand-sticthed day beds. Biodegradeable and Australian grown and manufactured. SSI9-40 is a standard density foam commonly used in quilting, and "is not recommended for any seating application," see below. 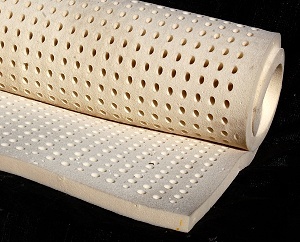 N30-130 is the most common general foam, popular in mattresses and caravan bedding, rated as a premium density foam. Only HR36-110, a high density foam designed to give a softer initial feel with deep down support, is used in real mattresses. It is fire rated and conforms with all commercial standards., and is typically used for commercial cushioning, commercial backs, and office furniture. A man-made lightweight fibre of minimal reliance, its use is ubiquous in modern upholstery manufacture. Rather than "non-prefered," polyester fibre has no place in a real mattress. 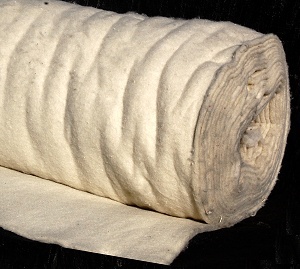 Wool-polyester fibre is available in a range of blends, invariably at a substantial reduction in the manufacturer's input cost, see polyester fibre above. This is most regularly used in modern mattresses as the top comfort layer, effectively the sleeping surface, quilted to the mattress fabric. 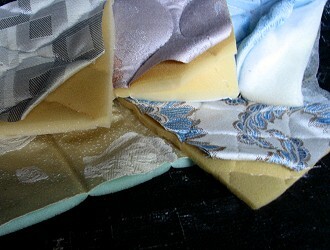 The low-density foam is a requirement of the high-speed quilting process. 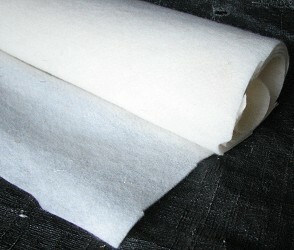 Occasionally a layer of polyester fibre is added for a "plusher" effect. Left: Various fabrics quilted in various patterns and various foam thicknesses, foam and polyester. top right. Hand-quilted realbeds border, bottom left (recommended). Developed by NASA to facilitate sleeping astronauts , it stabilizes the sleeping position in zero-gravity by depressing around the body in response to body-heat. Some clients have reported some difficulties with the product, mostly caused by excessive "over-heating." - commonly marketed as an "upholstered" base. Also: cardboard, 9mm foam, cotton fabric border, and melded fabric top, with twin-wheel castors.